Post updated May 2018. Originally posted May 2015. Have you tried a lava flow? Basically it’s a really awesome pineapple-coconut drink with a strawberry swirl layer. It’s ahhhhmazing. Fresh, creamy, light, and perfectly sweet all at once. It’s an awesome drink, sure, but in my opinion, they make even better popsicles. 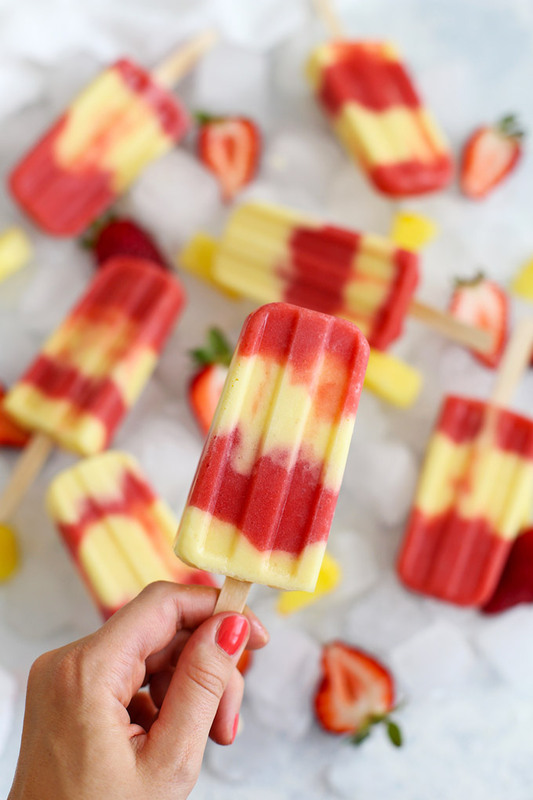 I love the creaminess of the pineapple coconut layer swirled with the bright, fresh strawberry layer. My mouth is watering just typing that out! 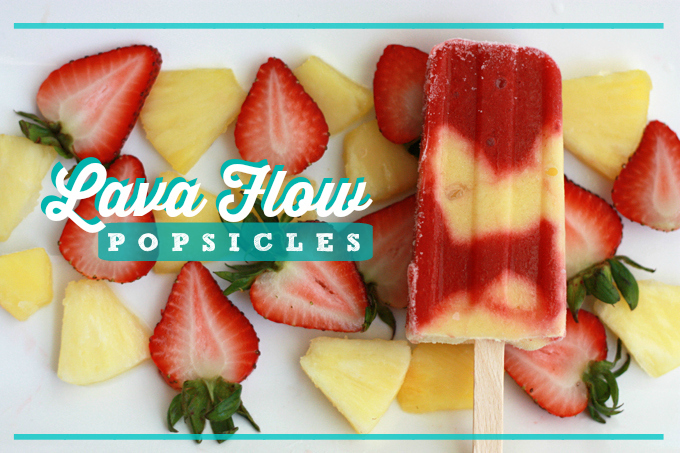 These lava flow popsicles have been a MEGA summer favorites for the last several summers, and we loved making our first batch of the season over the weekend. They’re as pretty and delicious as we remembered! This is one of those recipes that looks tricky, but really isn’t. They’re as easy as can be! It’s really just as easy as blending up two batches of smoothie and alternating them in your popsicle mold. 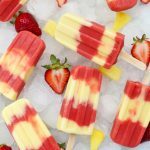 It’s an easy one for kids to help with, and I love that they’re naturally sweetened (only 1 Tbsp of honey or agave for 10 popsicles–and that’s if you choose to add it!). They’re GORGEOUS (especially these ones! ), but they’re also as delicious as can be. We crave them all summer long! Easy-peasy. All my best tips are below! How to get the perfect swirl: don’t think about it too much! I’ve tried a lot of things but, simply going slow and adding a spoonful or small drizzle at a time gives you great layers. It’s okay if they’re not all perfectly equal or look identical. That’s part of the magic! Sweetness. I’ve found these are perfectly sweet for my taste, but depending on your fruit and your own preferences, you may want to add a little drizzle of honey or agave. Let your tastebuds be your guide! Fresh vs. Frozen. 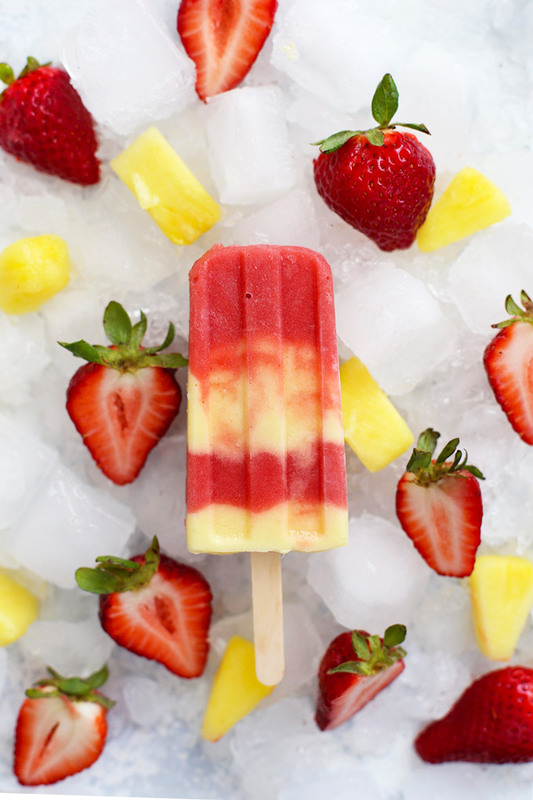 You can make these with fresh or frozen fruit (or a combination). Your proportions will be the same. If you’re using frozen fruit, you’ll want to let it thaw slightly so it blends easier. Otherwise, you’ll need slightly more liquid to blend frozen fruit than fresh. How to I store them? After they’re totally frozen solid, I typically remove them from the mold and put them into a zip-top freezer bag. It works like a charm! Popsicles will keep 2-3 weeks, though I doubt they’ll last that long without being eaten! MAKE THE PINEAPPLE LAYER: Place ingredients in a blender and puree until completely smooth. Add additional coconut milk as needed. Transfer pineapple coconut mixture to a liquid measuring cup or a small pitcher while you make the strawberry layer. MAKE THE STRAWBERRY SWIRL: Place ingredients in a blender and puree until completely smooth. FRESH OR FROZEN. You can make these with fresh or frozen fruit (or a combination). Your proportions will be the same. If you’re using frozen fruit, you’ll want to let it thaw slightly so it blends easier. Otherwise, you’ll need slightly more liquid to blend frozen fruit than fresh. HOW TO STORE THEM: After they’re totally frozen solid, I typically remove them from the mold and put them into a zip-top freezer bag. It works like a charm! Popsicles will keep 2-3 weeks, though I doubt they’ll last that long without being eaten! « Five Fact Friday – Busy Waiting! Good Heavens. 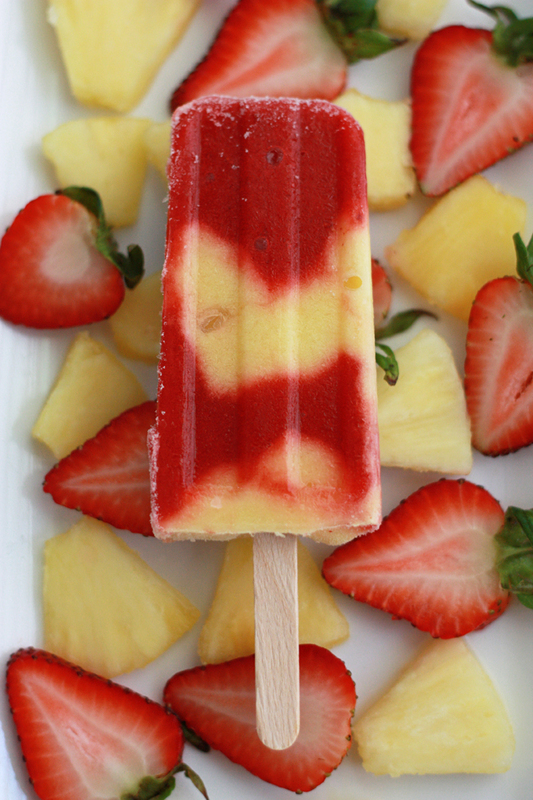 This may be the most beautiful popsicle I’ve ever seen! These look amazing! They’re definitely going on the summers “to eat” list! Can you use the canned coconut milk for this or does it matter? Rene – That’s what I use! Canned coconut is preferred! I’ll put that in with my notes. Best of luck! 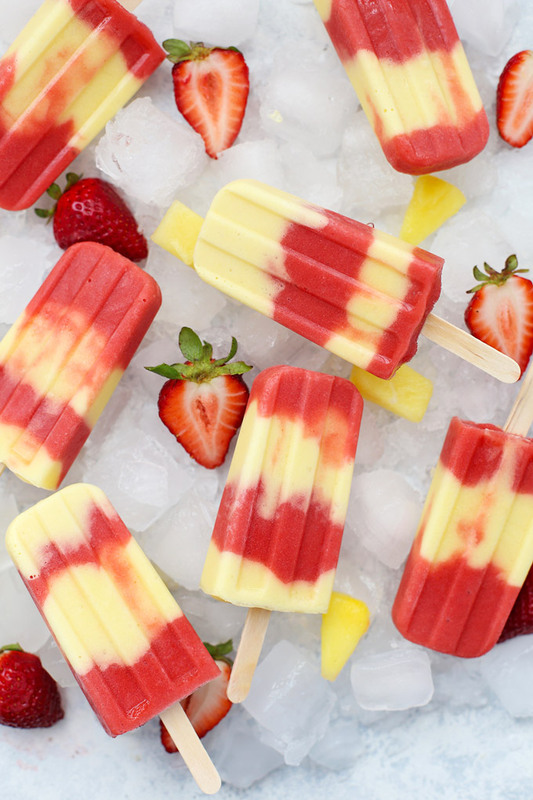 We’re on a huge popsicle kick this summer and these will fit in perfectly! Where did you find your popsicle molds? Maria – I put a link in the post to the popsicle mold I ordered. It’s from Amazon. I’ve seen similar ones on Zulily or at World Market. I love it! Do you have a suggestion for an alternate to coconut milk? Have some relatives allergic to coconut. Amanda – The coconut is pretty important for the flavor, but if you are working with a coconut allergy, I’d suggest dairy milk. Hello, can I use boxed coconut milk or does it have to be canned? I have both either way, just curious. Thank you! Boxed will work, but it will be slightly less creamy than canned. Great question! These look amazing! Curious, how long do these need to freeze for before they are ready to eat? Bethany – Great question! 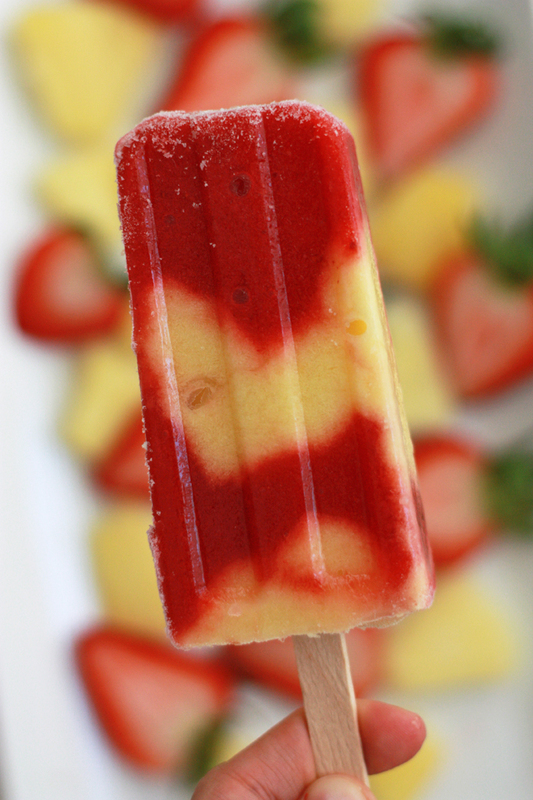 It’ll depend on what popsicle mold you use, but for the one pictured, about 2 1/2-3 hours is perfect. I’m allergic to mangoes, oranges, (as well as lemons, lines, grapefruit). Any suggestions for substitutes in the recipe? Michelle – It sounds like this might not be the right recipe for you since the substitutions would change the flavor fairly significantly, but if I were to make some suggestions, here’s what I’d do: you could leave out the orange juice in the strawberry layer, and substitute banana in place of the mango. I do hope that helps! I know allergies make things so hard sometimes! 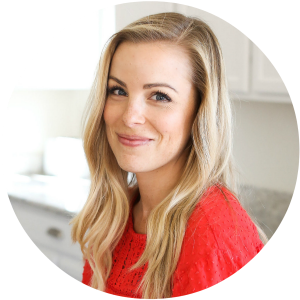 Super simple, healthy, and kid approved! YAY! I love hearing that. My kids just LOVE them! Do you skim the coconut cream off the top of the can or reintegrate it with the milk? MY pleasure! We LOVE them!!! We can’t do fruit juices here is the orange juice important in the strawberry layer? It does add a bit of sweetness and brightness. But you could probably get away without it. You’ll just need to add another liquid instead (like water) to help it blend. I’m happy to have finally found someone who shares my obsession with homemade popsicles! Love this recipe! We also love your coconut lime popsicles! Hi! Does these have a coconut flavor? Not a big fan of things that taste like coconut?